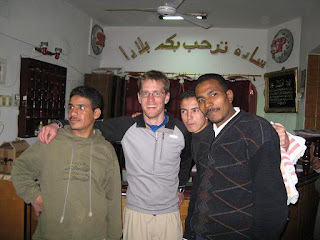 When I got to Sohag I was assigned a body guard, Mohamed, and told to stay in my hotel. Mohamed agreed walk around town with me for an hour which was pretty cool of him. Otherwise I just sat around drinking tea with the hotel staff, Mustafa, Osama and Shitos, pictured above. At this point I decided to just take a micro-bus to Luxor. Enjoying the blog Dan. Keep it up.